Our daughter’s school resumed yesterday for the second semester for the Japanese school year (April – March). After a month and a half of summer break, she was so excited she got out of her bed in the morning and jumped up and down in delight. Since May, I got very busy with my freelance job and didn’t feel like posting anything. But I decided to resume my posting, especially because my bento making obligation will only last for another half a year. Our daughter will start her elementary school in next April, which comes with delicious & healthy school lunches. My daily bento making resumed this morning for the new Japanese school year. 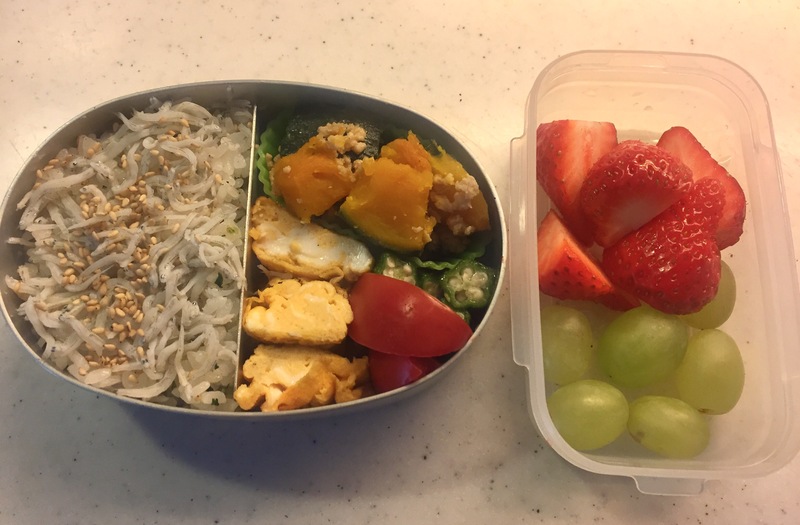 I got up early, set the rice cooker, made omelet, took out other ingredients from the fridge I had prepared the night before, packed them nicely, got dressed while the rice was being cooked, packed rice, all nice and neat in the bento box, right on time, and everything was going perfectly. My husband told me this had never ever happened before. Yeah sure, but how about the bento? I wanted to scream but held back… (got whiny instead). He then innocently told me to just wash it off and wipe a little. Yeah right. How can you wash omelet or rice or soboro pumpkin with water… How convenient if you can do that! To my dismay, I had to repack everything. As for the omelet I chopped off the top part (hence shorter than the original), for the shirasu rice I scraped off the top and added the leftover (thank goodness I still had some left next to the rice cooker not on the kitchen counter), and for the soboro pumpkin I had to put them in a separate bowl, carefully remove the ones with most coffee on them and put the rest back (I’m pretty sure some coffee was still hiding inside but at that point I couldn’t care less). 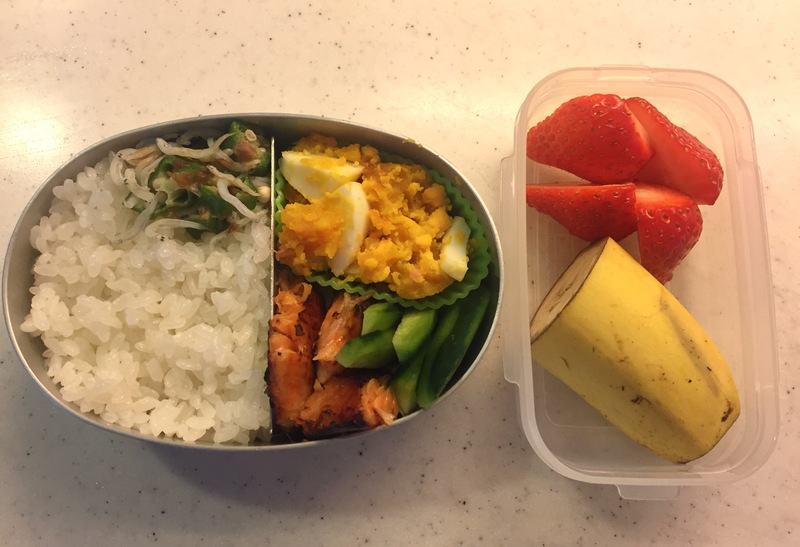 Voila, here is my daughter’s repacked bento for the first day of this school year’s bento making. I’d say it’s a great start!